Majuli is a river island, which is located at the mid of the river Brahmaputra of Assam, India. This river island is formed by the river Brahmaputra and two other tributaries of the river- Kherkatia Xuti and Subansiri river. The island covers an area of 352 sq. km (as 2014 census). 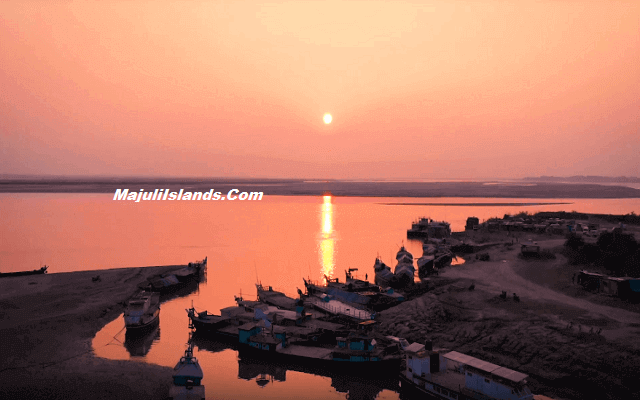 The Guinness Book Of World Records declared Majuli as the Largest River Island In The World and in the year 2016 on 8th September Assam Government declared Majuli as a District. It is one of the newest and smallest island districts in the world. Basically, the population of the island is consist of three main tribes- schedule caste, tribal community, and non-tribal community. Tribal Community People: Mising, Sonowal Kachari and Deori etc. Non-Tribal Community People: Kalita, Ahom, Chutiya, Nath(Yogi), Brahmin, Mahanta, Koch, Keot etc. Schedule Caste Community People: Kaivartas. All the above communities have different types of lifestyle and a different culture. There are several community people lives on the island and all of them celebrated different cultural festivals. The main festivals which are celebrated in the river island are-Ali-ai-ligang(Mising), Bisu(Deori), Falgutsav, Raas Leela Of Shri Krishna(Raas Utsav), Garakhia Sabah, Nora Chinga(Mising), Na Khowa, Barsik Bhaona Sabah, Magh Bihu(Bhogali Bihu), Rangali Bihu(Bohag Bihu), Kati Bihu(Kangali Bihu), Janmashtami, Paal Nam, Diwali, Shri Sankardeva's Death Anniversary, Shri Sankardeva's Birth Anniversary, Shri Madhavdev's Death Anniversary, Po'rag(Mising), Sawania Puja(Deori), Saraswati Puja, Lakshmi Puja, Sivaratri. Nowadays some un-seasonal cultural festivals are also celebrated in the island-like Majuli Mahotsav. Therefore the island is referred to as the cultural capital of Assam or cradle of Assamese civilization. The Satra is one of the Neo-Vaishnavite cultural and religious monasteries of the island. There are 665 Satras are present at Assam and out of them, 22 Satras are situated in Majuli at present time. Out of the 22 Satras, four of them are the main Satra which are- Auniati Satra, Garamur Satra, Kamalabari Satra, and Dakhinpat Satra. In the fifteenth century, there are 65 Satras were established by the Assamese great saint Sri Sri Sankardeva & his disciple Sri Sri Madhabdeva. The Naamghar is another religious monastery of the island. There are several birdwatching places in the islands for the bird lover. Basically, three localities of the island are famous for the bird viewing places which are- Southwest, Southeast, and Northern region. In the island, there are several Beels are located in the different places which are known as the most popular bird viewing place of the island. The name of the Beels are- Rambolia Beel, Chakoli Beel, Dubori Toli Beel, Borbilla Beel, Daukpara Beel, and Vereki Beel. There are several residential birds like Civets, Jungle Cats, Brahminy Kite, Drater, Pallas's Fishing Eagle, Greater Adjutant Stork, Purple and Gray Herons, Jackals, Common Otters, Bar-Headed Graylags, White-Necked Stork, Asian Open Bill, Black Stork, Lesser Adjutant Stork, Brahminy Ducks, Lapwings etc. and migratory birds like Sand Pipers, Plovers, Dalmatian Pelicans, White Eye, Gulls, Eagles, Falcons, Pintail, Gray Lags, Northern Shoveller, Spot-Billed, Ferrogeneous Pochard etc. are seen in the Beels of the island. In the island, people can also see the beautiful scenery of sunset at the seashore of the river Brahmaputra. Although the economy of the island is agrarian there is another popular industry is present in the river island which is called Village Pottery Industry. This industry is another economical backbone of the Kumar community people of the island. Basically, Kumar community people of Salmora, Dakhinpat and Sinatoli village of the island produces several pottery products like Mola, Murti, Nadia, Choru, Dhool Dani, Dhuna Dani, Bonti, Horai, Mala Charu, Gamla, Flower Tub, Pati Kalah, Dangor Tekeli, Ghot(Tekeli), Dunari, Udhan, Bor Kalah, Chaki, Bhuruka, Mathiya, Vabuki, Negera etc. These pottery products are made from a soil which is known as Kumar Mati and this soil is found only some special region of the island. Raas Leela(Raas Utsav): It is the main and popular colorful cultural festival of the island and it is celebrated during the month of November(winter season) every year for three to four days. All community people of the island are involved in this festival. Ali-Ai-Ligang(Mising): It is the main and popular festival of the tribal Mising community people. They celebrated this festival every year. Paalnam: Paalnam is one one of the most popular Satriya festivals of the island. Basically, this festival is celebrated in the month of December every year only in two Satras which are- Sri Sri Auniati Satra and Sri Sri Dakhinpat Satra. Locally the people of the island speaks three languages- Assamese, Mising and Deori but the Assamese language is only the main language of the island. The island is world famous for colorful Mask Making culture. Mainly the colorful and beautiful masks are made in Sri Sri Chamaguri Satra by Mr. Hemchandra Goswami. It is one of the pottery cultures of the island and is made from Kumar mud, Bamboo, and cloth. In the year 2016 on 8th September the Government Of Assam declared the island as a district. After that this island becomes the smallest and newest island district of Assam. The Majuli island falls under the Lakhimpur Lok Sabha Constituency(reserved for ST)which is composed of 9 Assembly segments of Assam & it falls under 99 Vidhan Sabha constituency(reserved for ST). In the year 2016 to at present Shri Sarbananda Sonowal is holding the position of Member Of Parliament(MP) from Bharatiya Janata Party(BJP). Currently, he is the Chief Minister(CM) of the Assam state and he is the first CM of Assam who was elected from Majuli district.